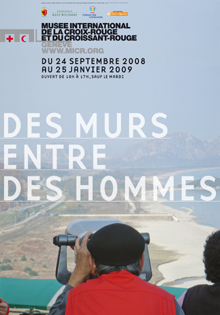 “Walls Between People” is a new exhibit at the Museum of the International Committee of the Red Cross Red Crescent in Geneva, Switzerland from September 2008 to January 2009. The exhibit is based on the book by Alexandra Novosseloff and Frank Neisse and artistically presented by Robert Ireland. Using military maps, the exhibit illustrates eight modern walls around the world: the wall separating North and South Korea; the dividing line in Cyprus; the peace lines in Northern Ireland; the divide that crosses the Western Sahara from north to south; the border fence between the US and Mexico; wire fence in Morocco surrounding the the Spanish enclaves of Melilla and of Ceuta; an electric fence between Pakistan and India; and, the wall separating the Israelis and the Palestinians. The images and emotions expressed in the exhibit are powerful. I remember living close to the Berlin Wall. On family outings we would tour West Berlin’s historical spots and at times climb outposts to look over the wall into East Berlin. I remember once my father’s voice changing tones suddenly and demanding, “You will not touch the wall. You will not look like you will touch the wall. And, you will not make any sudden actions.” We were in an outpost within site of the East German guards who had orders to shoot to kill and ask questions later. I was reminded of the emotional intensity of separation and fear when I saw years later the metal fence with similar memorial crosses and flowers for those who tried but failed to cross the border from Mexico into the US. Do we ever learn? Tags: "Walls Between People", Alexandra Novosseloff, Art, Berlin Wall, Books, border fence US Mexico, Ceuta, Cyprus, Frank Neisse, Geneva, Humanitarian, ICRC museum, India, International, Israel, Melilla, Morocco, Northern Ireland, Pakistan, Palestinians, Robert Ireland, South North Korea, Switzerland, Western Sahara. Bookmark the permalink.